Last weekend Jacob and I celebrated our 7 month anniversary. We headed up to Downtown SLC (yep, a real long drive) and stayed in the Homewood Suites. It was nice to just get away and play tourist in a city I am in everyday, but never really see. We started the day off by going to the State Capitol to see where all the important legislature happens. Alas, it was a boring day up on Capitol Hill. No important bills to be passed- just everyone gone home for the weekend. 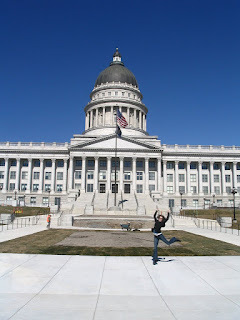 This is me jumping to be at the capitol. 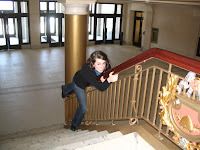 The white set was the staircase that Jacob wouldn't let me slide down. This other staircase, in the basement, was the only one he would let me slide down. Party pooper. know that tw0 really big airplanes can fit in there?) We also went to the top of the Wells Fargo building, and I learned that I am allergic to heights. Not scared, just allergic. I left feeling really dizzy, but don't you dare call me afraid. 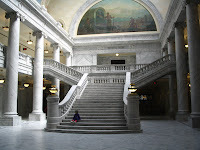 We then saw the Joseph Smith movie at the Joseph Smith Memorial Building. It was really good, although I did have to close my eyes during the scary parts. 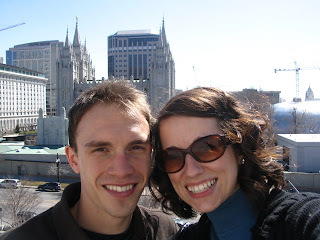 This is us on the roof of the Conference Center, you can see the SLC temple behind us. 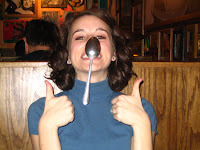 Here we are passing time while we waited for our food at Buca Di Beppo. 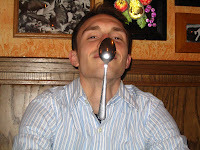 This really is a feat, the spoons are huge. Yes, maturity becomes us. I sure do love weekends away, and this one was perfect. Have a great week! this post is great. i loved that you toured SLC. that made me happy. hhhhaha. i miss you so much but can't wait for may! 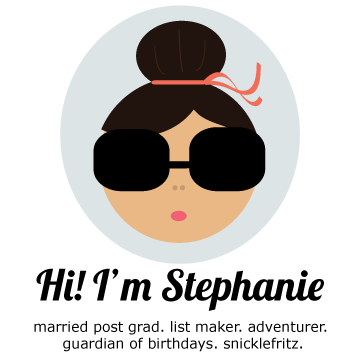 I love that I have lived in Utah my whole life and I have never done any of those things either! Sounds like a blast!